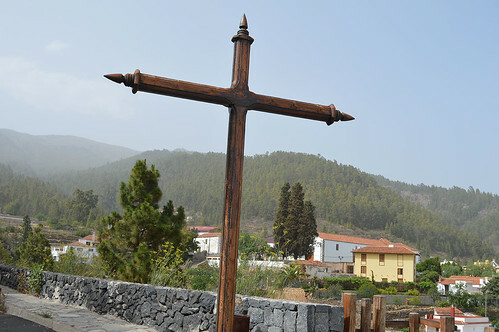 Vilaflor couldn’t be prouder of Hermano Pedro, the great man was always their favourite son even before he became the Canary Island’s first Saint in a 2002 ceremony in Guatamala. 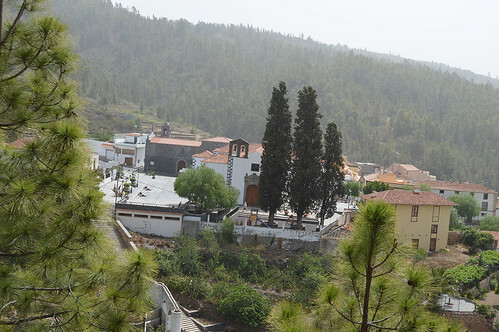 It’s no wonder he is everywhere in the charming Tenerife village on the road to Mount Teide. With a good long walk in the hills around Vilaflor completed I was able to take my time and have a good stroll through one of my favourite areas. It’s not just Brother Pedro who feels the love, the main street shows how much the place is cared for. 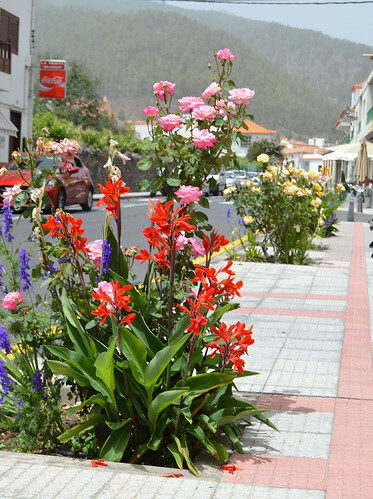 Dazzling displays of blooms burst forth from well tended flower beds, a detailed map signposts the cafes, restaurants, and main shops, and the place is spotlessly clean. 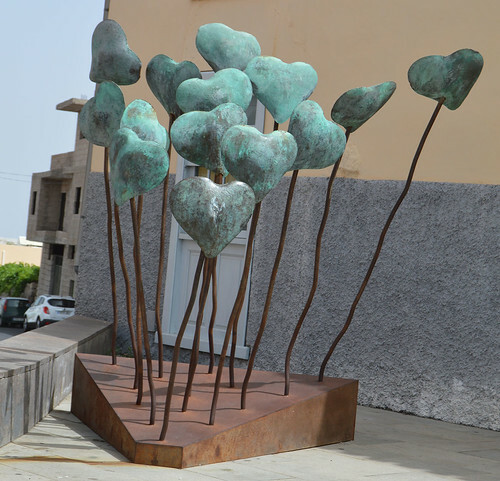 Half way up the street in a mini plaza is a sculpted display of hearts, they’re a romantic lot. Each time I have visited I have always been struck by how quiet it is, most locals probably have to travel to find work. It was nice to see that the local council provide weekday summer buses down to Los Cristianos beach up to a maximum of 60 euros for 6 weeks. That works out even cheaper than my Titsa public bus trip of just 2.10 each way with a bono saver ticket. 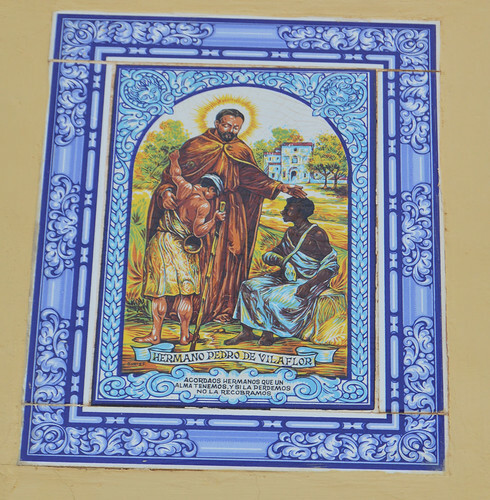 Our friend Pedro adorns most houses in Vilaflor on ceramic tiles but his main stage is the large plaza further up the hill, the focus for visiting tourists. 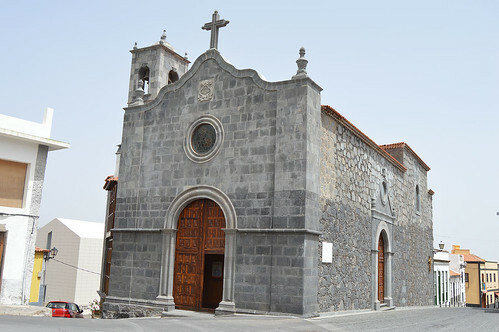 Two large churches dominate the area, the oldest was built onto the house where Pedro was born, an original section of the house has a further statue in the garden and our saintly friend is even featured in the design of the railings. 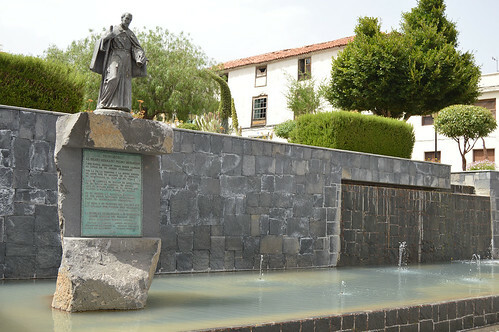 In front of the more modern white church a multi layered garden with flowing water makes an impressive centre piece. 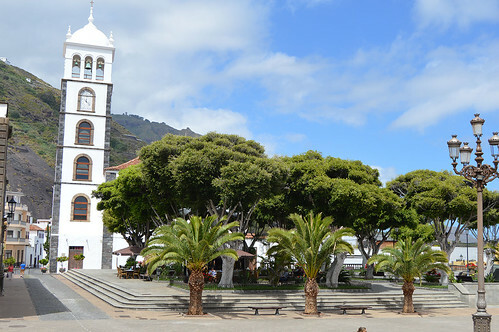 The Tourist Information office is in the plaza and can provide routes for several splendid local walks. Heading out at the top end of the village is worth it not just for the elevated views but also to see Los Lavaderos, the old communal clothes washing area. Spring water used to pour forth here and with the help of an old pump the water would pass over large slabs where clothes could be scrubbed and left to dry. 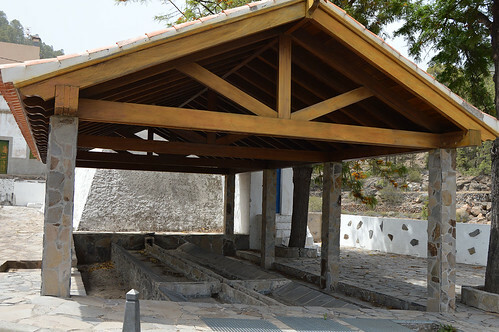 It’s an important part of local history with the bottled water depot next door also harking back to the reason people settled in Vilaflor – and who said that history could be a little dry. Maybe the marina wasn’t floating as many boats as predicted but four years on from its opening it was a welcoming sight as the Buenavista bus brought me into Garachico. Icod de Los Vinos was still emerging from early morning low cloud but the coast was bathed in sunshine. Some 200 berths were supposed to kick start the local economy with pleasure craft and excursion boats, Garachico is resilient and has always come through in the past, this might take a little longer. 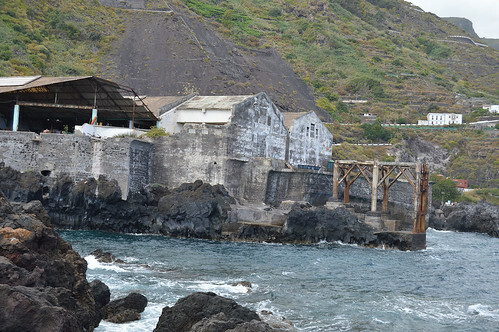 The big volcanic eruption of 1706 destroyed the old port, walking along the coast road I could see the marks of a constant battle with lashing waves but thankfully it was a calm and beautiful day. The volcanic spit of rock just off the coast was speckled with seagulls, it’s one of those sights that always offers different aspects with the seasons, weather, and even time of day. Two coach loads of school age tourists poured out at the football ground car park, the sturdy concrete buttresses at the front of the ground bear the smears and scratches of previous wild tides. That doesn’t mean the town shies away from the sea, a few yards from the salty spray there were plenty of takers in the smart man made pools that lead to the craggy and hugely enjoyable natural channels of El Caleton. It had been a while since my last visit and the white canvas shades at one end of the rock pools were new to me. They added a nice modern touch but the walkways through the rocks below Castillo de San Miguel surrounded by thick white edges made me think of a police crime scene – maybe I watch too much CSI. Further round the old port loading area harks back to busier trade routes, a small seating area was populated by some senior citizen locals contemplating the world. I could aspire to that job, a hefty cigar seems to be a key part of the uniform, I’m sure I could chew on a sweet or chocolate version. It was time to retire down one of the narrow passages opposite to emerge in the large open Plaza de la Libertad. 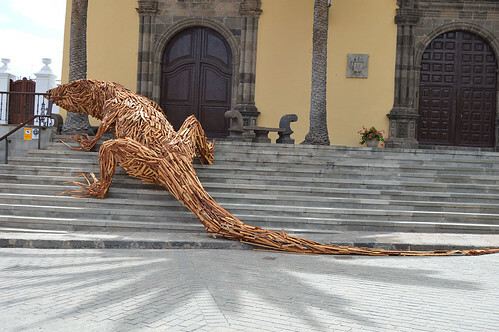 It seemed my arrival was just in time as a giant lizard slithered up the steps of Nuestra Senora de Los Angeles church. Phew, on closer inspection it was part of a series of amazing wood sculptures from Luigi Stinga, I was hoping to catch one before they perish in pre planned flames. It struck me as very appropriate, last year Peter Capaldi had stood on just about the same spot when filming a Doctor Who episode. Across the plaza the tall white tower of Santa Ana church dominated the skyline and the striking of the hour was light and melodic. Garachico is still pulling in the tourists, I saw several large walking tour parties, and even with the afternoon barely an hour old the fish restaurants were a popular stop off. Duty called so I made the 10 minute bus journey back up to Icod and Santa Barbara, you can read about that leg of my tour in Island Connections as from 22 June. 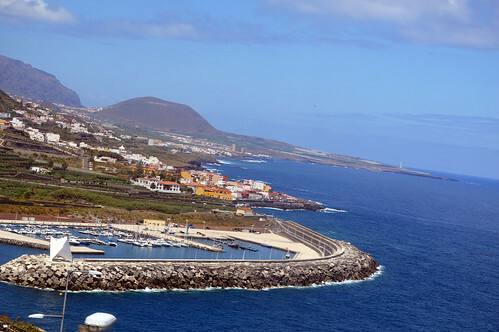 Traveling up through the cheese grater road tunnel with its circular ports reminded me that I must try walking down into Garachico from El Tanque – maybe next visit. Is it the mopping of the brow, the plop of the ice creams, or the smouldering rubber of mobility scooter wheels. 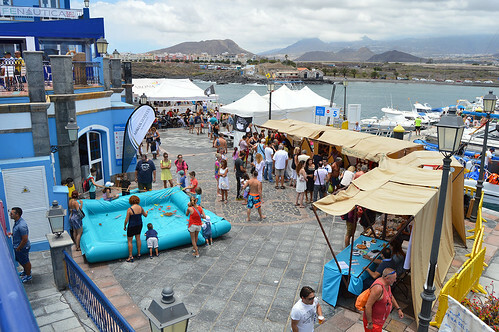 They are all clues to the arrival of summer’s peak in Tenerife but in downtown Los Cristianos it’s the diversity of street activities that is the clincher for me. I never know what I’m going to walk into, an early evening exit from browsing in the cultural centre library and the slip road had been transformed into an assault course for dogs with large litter themed props strewn around. 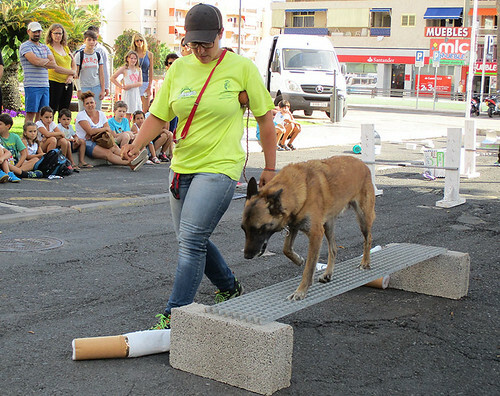 Arona Ayuntamiento (council) were promoting environmental awareness among youngsters and an attentive young audience had gathered to `learn solutions they could use to chastise their sinful parents. 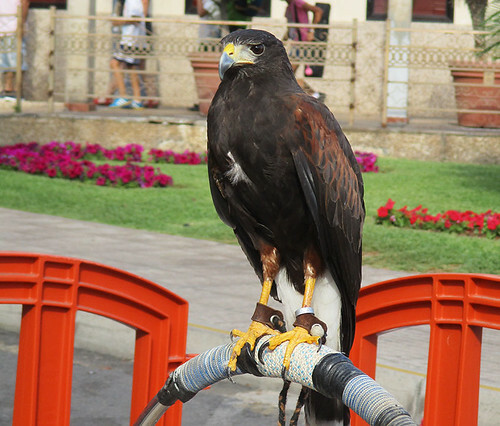 A hawk stood on guard on its perch, I think I had missed its moment of glory but a trainer guided a dog up and down the course to pick up selected litter items as indicated by the children. The youthful jury were then able to select the correct container for the dog to drop the rubbish in, plastic, paper, food etc. Everyone wants dog pooh taken in hand or stamped out, but not literally, so a few plastic walnut whips were scattered around for removal, some children were even shown how to pick them up without touching by using a plastic bag. It caused quite a bit of merriment, and some guilty looking parents may have been shamed to clean up after their dogs in future. 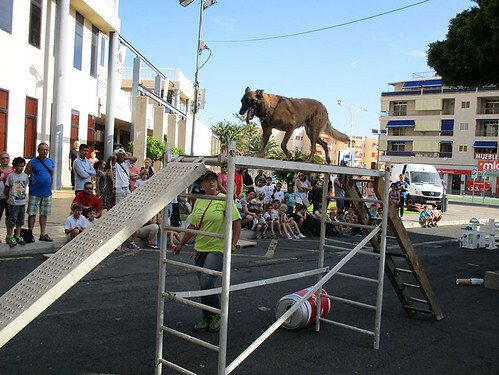 The entertaining programme is touring the Arona municipality through June and there are even two open days at the Arona refuse depot on 25 and 30 June. Just a few days later I came across a large corporate team building challenge taking place at Las Vistas beach. A coach load of workers from Innospec, a global chemical company based in Ellesmere Port, Cheshire were over to test their practical and financial skills in a series of challenges. It was like The Apprentice meets It’s A Knockout. I caught the last act, the teams had to build catapults from a selection of parts to propel water filled balloons. Extra materials and further glimpses at the plans cost them cash, as did malfunctions on their test firings. It was all fun and very safe with medical staff on hand. 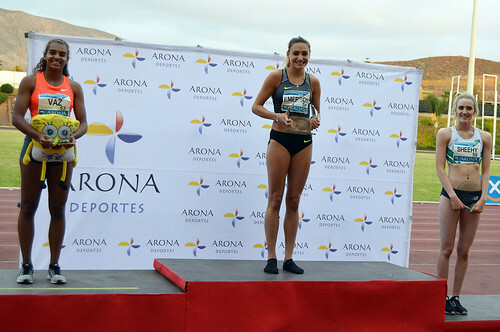 This was a new one on me, I am aware of many sporting youth groups that come to Los Cristianos for sports based courses on the beach or at the big swimming complex. 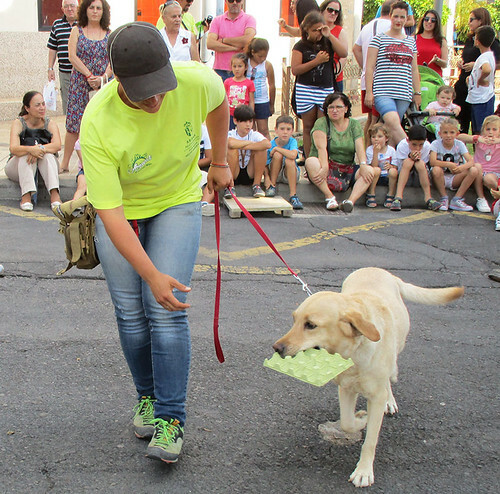 Arona council run a large programme of their own summer leisure activities from baby swimming to golf, kayak, and padel classes, for locals and non residents. There’s a brochure you can pick up at the cultural centre or online at the councils website. 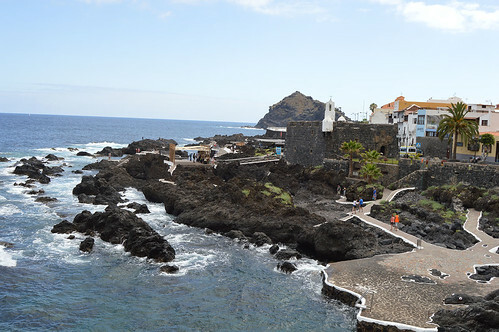 I’m quite happy with my regular sea swimming, now which way id La Gomera? 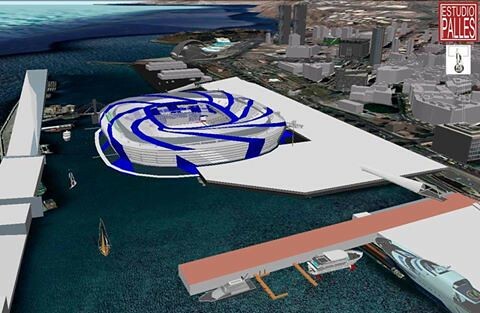 Who wouldn’t want a new 40,000 stadium as part of a 300 million euro leisure development? That’s the central policy of Juan Quintero’s bid to become the next President of CD Tenerife. 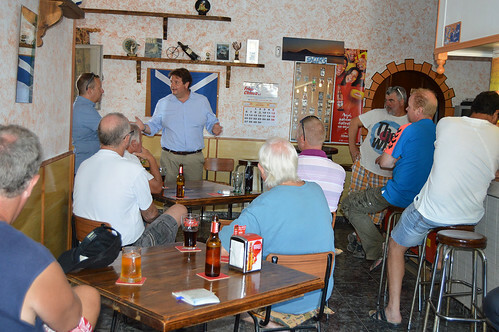 The Armada Sur are supporters of old school football values but a small group of us were happy to welcome the front man of the project to Suters Bar in Parque La Reina to find out more. Firstly we got to learn a bit more about the man, Juan Quintero, a 50 year old insurance broker born in Santa Cruz had requested the meeting and arrived informally dressed and greeted us all individually. There was a good cross section of our peña with Brits, Canarians, Dutch, and Austrian but our guest spoke to us in perfect English. It soon became clear that he is a football man, he recalled the glory days when he watched CD Tenerife’s exploits in the UEFA Cup, and stated his intention to see the club back in the Primera as an established fixture. All that would be backed up by an ambitious business plan to generate more support and income for the club. Onto more practical matters, does Juan have the shares and backing to oust current unpopular President Concepcion (below) who is up for renewal in December or before. Juan Quintero seemed supremely confident of amassing enough support to get elected, and vowed to sweep most of the long serving and under achieving board out. Former player Pier Cherubino is the fans favourite for the top job and Juan was asked if he would consider teaming up to make the most of both their attributes and backing. Although not dismissing the idea he said that he had spoken to Pier but had not seen any concrete proposals from him. I should add that the Armada Sur has only a few token shares and cannot affect the voting. We were told that the new stadium would be built in 18 months from approval. It’s difficult for us not to be cynical about the slow bureaucracy here and the poor track record of completing major projects to a set budget and time scale. 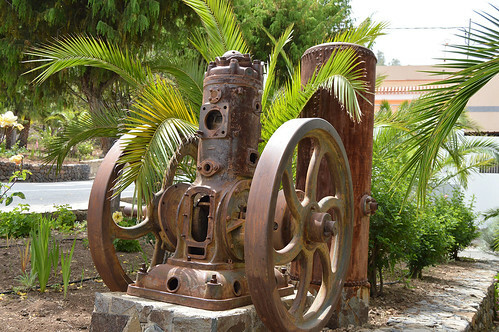 Juan also told us of two alternative sites, Hoya Fria on the southern edge of the capital, and the Cepsa refinery which is due to be decommissioned. In the meantime Juan said there is money and agreements from key players to join us to steer us into the Primera. 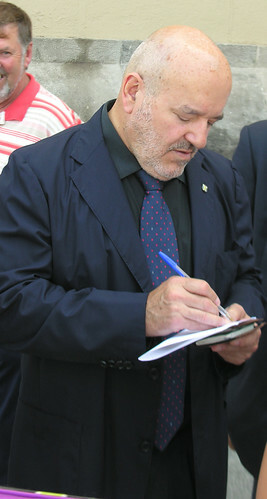 He did add that current contracts would have to be respected, that brings us to one of his innovative fund raising ideas. Canadian kit makers DryWorld have a new approach to sponsoring teams, they give the kit freely, and offer good income to the club for selling replica shirts. Juan said he has a five year deal set up with them, it would have to wait for the final season of the Hummel deal. This deal would include 20,000 worth of kit for the other CDT teams and he says there is a 600,000 euros shirt sponsor lined up. One worrying aspect of this is the company would supply a big name football ambassador to promote the club, originally the unpopular suggestion was an ex big star from Real Madrid or Barca. I can’t help wondering if this ambassador would have any input into team matters or even play if the sponsors wanted that! There was no getting away from our big concern of not getting a big enough increase in crowds. 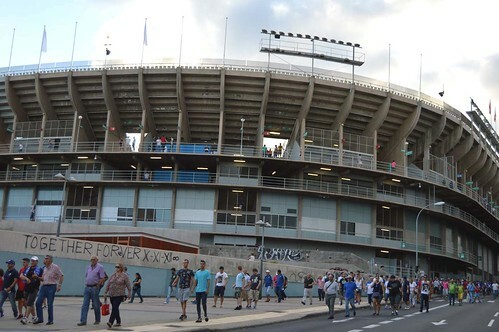 Special promotions with family offers, free buses from the south, and greater marketing were popular themes with Juan but breaking the mind set of armchair support for the big two in Spain is going to be a long hard push. On the plus side it was encouraging to hear Juan Quintero’s positive views echo ideas we have often proposed, and we appreciated him coming to see us in the long lost south. Each hurdle he can clear will increase his credibility. He has promised to be always approachable so if he becomes President maybe we can get more in depth details about his investors but for now our thoughts are on team building for the 2016-2017 season. 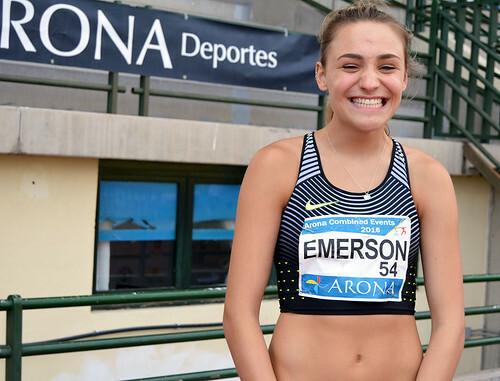 They came from as far away as New Zealand, Uzbekistan, and Finland, such is the pulling power of the Arona Combined Events meeting, now in its sixth year and with a growing reputation. 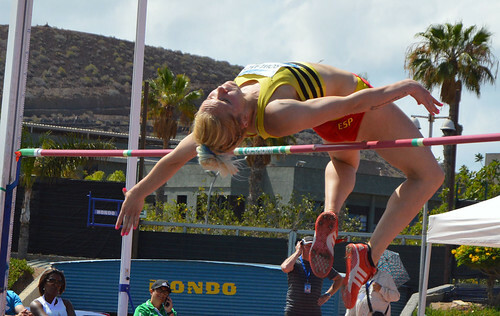 Spain provided the majority of the competitors but it was pleasing to see several Canarian flags on running vests. 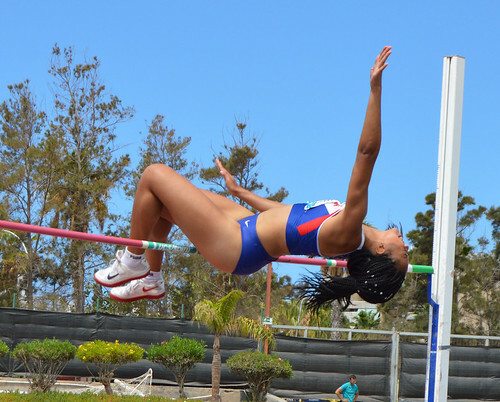 Great Britain had 12 athletes registered and Ireland had their lone entry with Shannon Sheely. 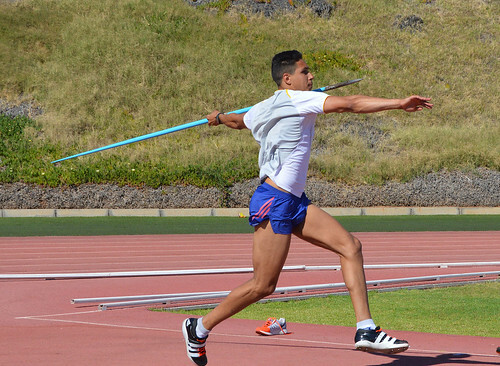 It was all set for two days of fiercely competitive decathlon and heptathlon, and they delivered in all departments. 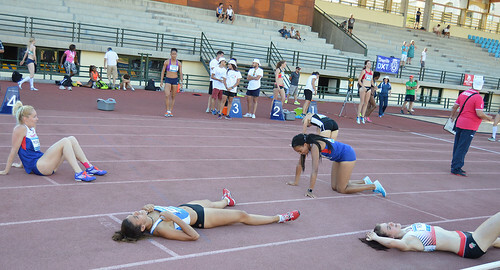 The straining, roars of triumph, and flat out performers who had given their all were contrasted by the encouragement and support given by the athletes not only to their own nationals but also the rivals from the other 12 countries involved. 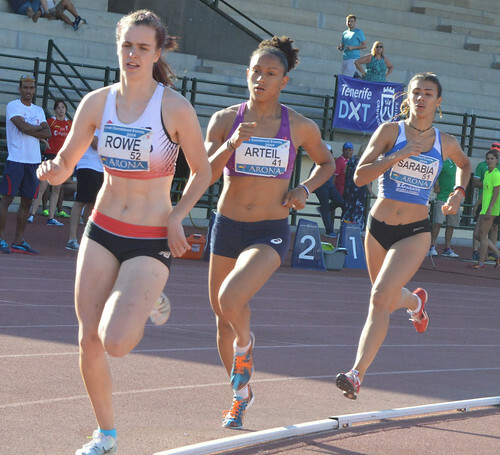 The Rio Olympics were still a distant dream for many, there were more pressing short term targets like the European Championships in Amsterdam at the start of July. 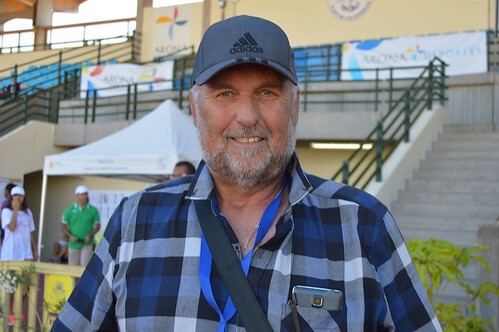 I recognized some returning GB faces like Martin Brockman, Jo Rowland, and Jessica Taylor, but a debutant in his first senior competition took my memory back to the 1980’s. 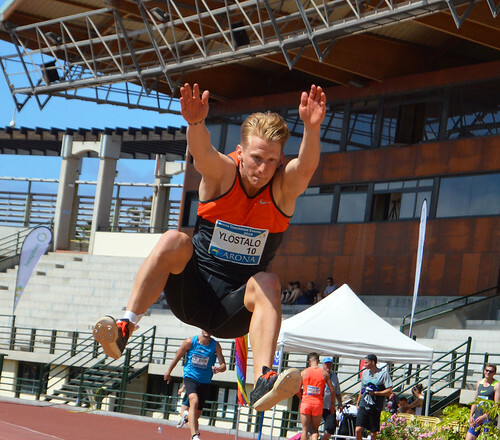 Elliot Thompson (below) has followed his dad Daley into the decathlon, and he was making good inroads in the long jump and shot putt on the first day. 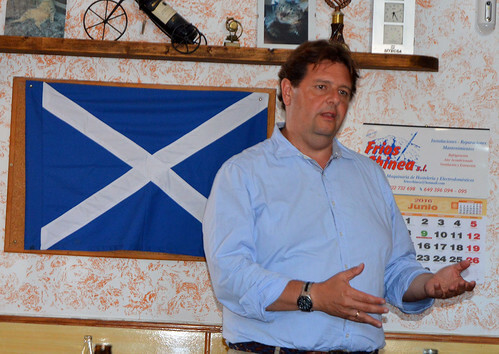 The presentations again underlined the international flavour of the competition. 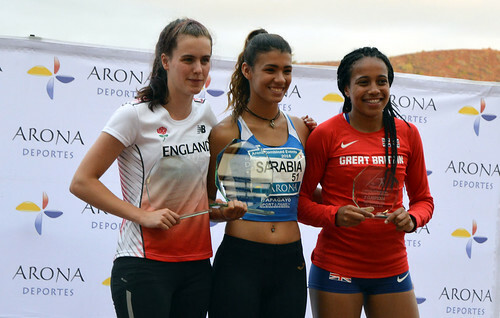 In the ladies heptathlon the under 20’s finished with GB’s Michelle Hughes bronze and Anna Rowe silver, and Paola Serabia of Spain taking gold. 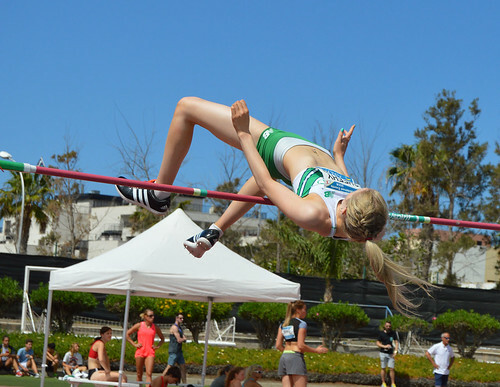 The heptathlon under 18’s went Shannon Sheehy (Ireland) bronze, Marisa Vaz (Portugal) silver, and Niamh Emerson (GB) on gold. 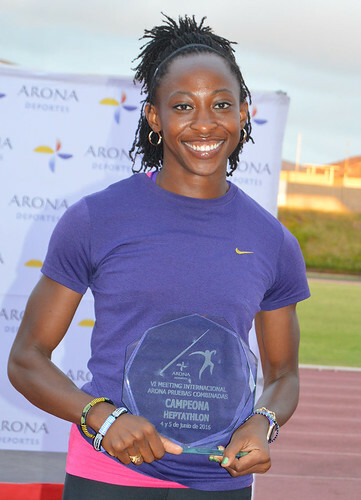 The senior top trio was Anaella Nyabeu (France) bronze, Lecabella Quaresma (Portugal) silver, and (below) Uhunoma Osazuwa (Nigeria) gold. 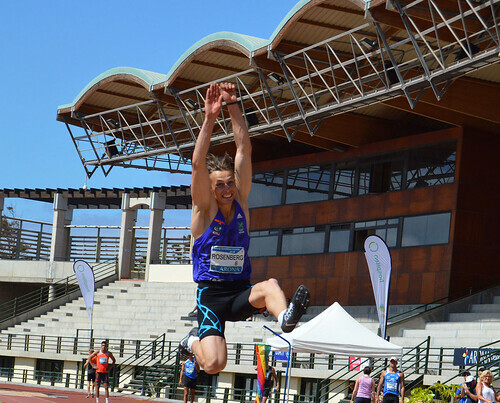 In the mens decathlon sections the under 18’s went to Jorge Davila (Spain) bronze, Manuel Dias (Portugal) silver, and Raul Schlecht (Spain) gold. 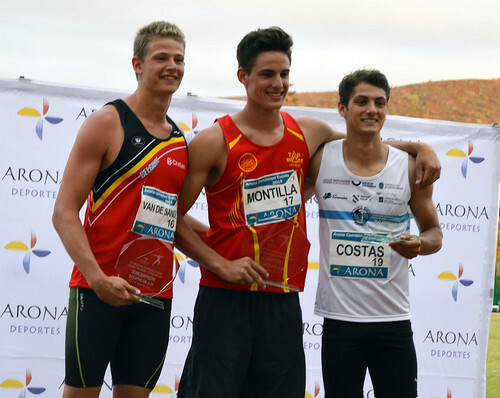 Under 20’s line up was Dario Costas (Spain) bronze, Alessandro Van de Sande (Belgium) silver, and Dimitri Montilla (Belgium) gold. 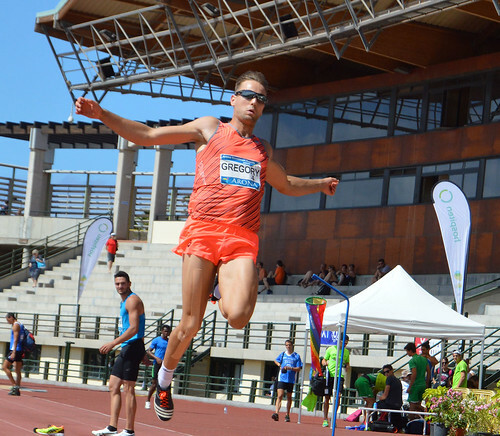 The senior mens awards went to Jeremy Lelievre (France) bronze, Romain Martin (France) silver, and (long jump above) Kristjan Rosenberg (Estonia) gold. All the effort put in on and off the track deserved a bigger crowd for the free event but too little too late on the publicity meant it was mainly families and friends watching. 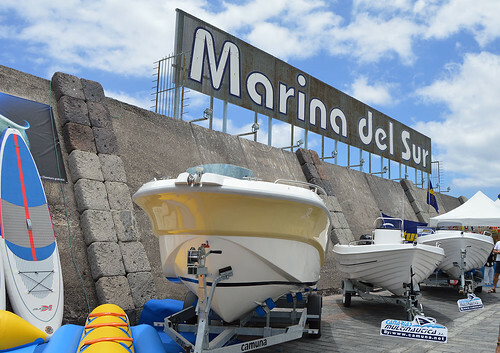 Whatever floats your boat, powers your jet ski, or paddles your board, they can all be found at the Marina del Sur in Las Galletas. 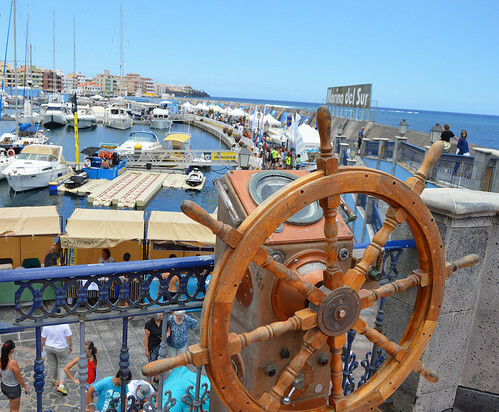 For the first weekend of June it was packed with activity as the Fenautica marine fair showed off the many ways to experience the sea in Tenerife. As I arrived on thee bus I could see the beach packed with sun worshippers as novices tried out kayak and stand up paddle surfing near to the boatyard. King Neptune looked down approvingly from his lofty perch above the first clutch of restaurants, and youngsters sat astride the old canon that stands guard by the fishermens sales huts. The Marina curls it’s protective arm around the beach side of town making it a safe haven for swimmers and a calm mooring spot. On the other side the promenade of bars and cafes looks out over the shingle beach where the ebb and flow of the tide is accompanied by the gentle crunch of the rocks as they are raked along. The big focus of the weekend was the marina, it always a doorway to pleasure trips and fishing as well as being a pleasant place to stroll. 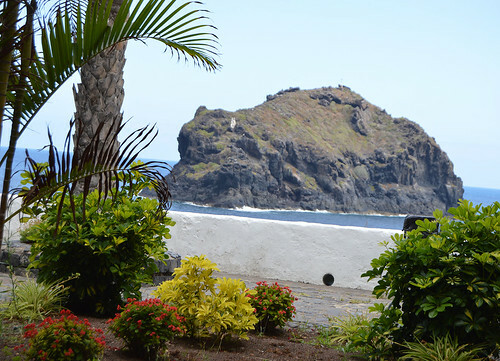 The Guanches Cup regatta had set off earlier and a flock of billowing white sails were bobbing along on the horizon, a few steps up to the harbour wall provided clear views out to sea. Along the marina walkway a variety of craft were on display from big cruisers to small individual boats. 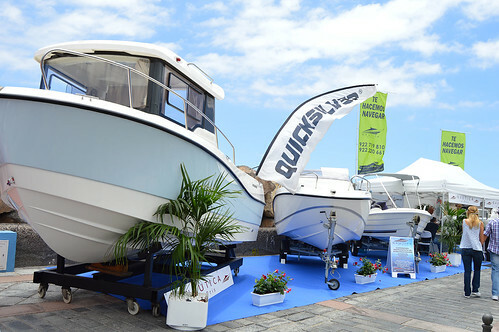 I recognized a couple of speed boats from the waterski racing championships of previous years, the next is at Playa San Juan in late October. 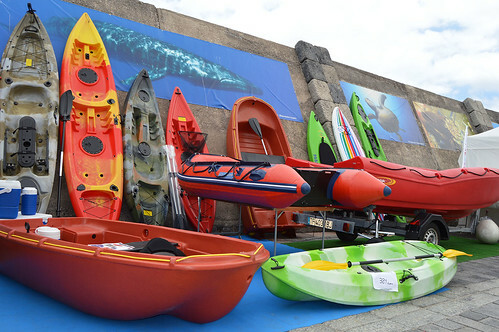 I have tried kayaking and really enjoyed it, a big display of multi coloured craft reminded me that I must do some more soon. 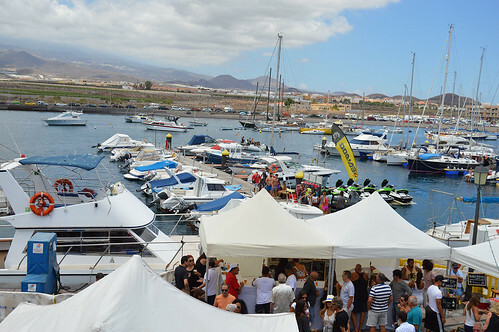 At the end of the marina there were stalls with food, drink, and even body painting. The pontoons leading down to the water were busy with eager trialists waiting to dip their toes into the delights of parascending, diving, and jet skis and many other aquatic diversions. 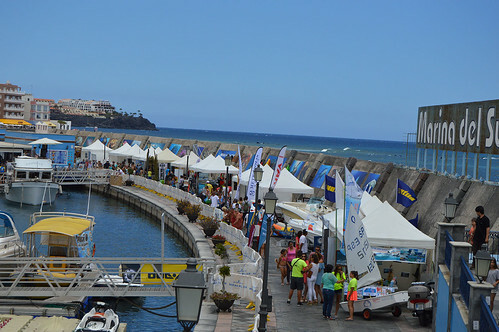 Throughout the two days there was plenty of music from a traditional Canarian drum band to the late evening live music on the stage at the end of the marina. I always enjoy my short hops from Los Cristianos to Las Galletas, there’s another good excuse to pop over on 18 June for Arona En Colores. That day will feature 14 hours of music, bargains, and family fun in the commercial zone including a mad rush of special offers at shops and cafes from 2 to 5 pm. Back at Fenautica everything was sailing along smoothly and Las Galletas was winning plenty of new converts.